We’ll skate you up the ice, literally. 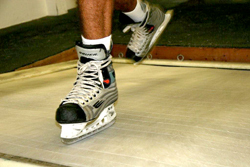 Our patented hockey treadmill is designed to accommodate varying speeds and elevations to target the two components of speed, stride length and stride frequency. The added resistance of the ice creates more forceful knee drive while the higher-grade forces longer, stronger extension. The result, an efficient skater with a superior stride to speed ratio. Like all our training, the skater is given one on one attention to develop and ensure proper skating mechanics. Emphasis will be on knee bend, stride extension, aggressive “toe off,” arm drive, and your recovery phase. Take it on the ice. Skaters are amazed how the treadmill translates to the rink. Speed feels effortless while other skaters seem to stand still.